These are the best places in the world to see wild African rhino, one of the most heavily poached species on the planet. 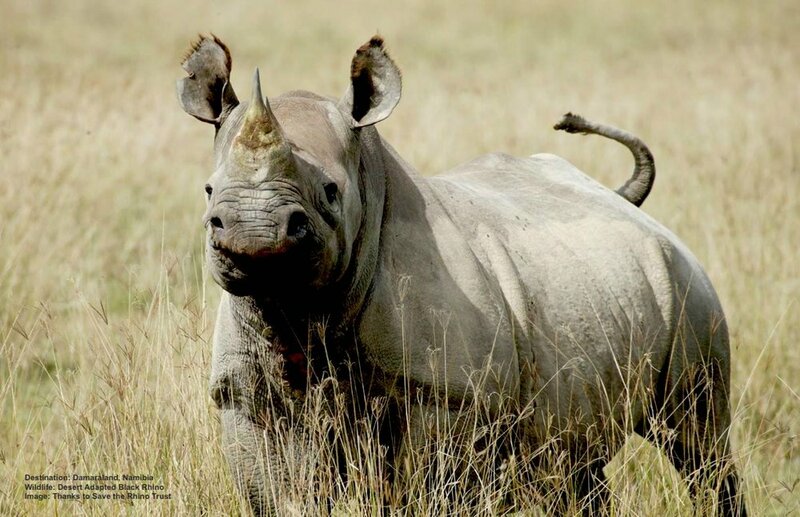 African rhinos, both the black and the white species can be reliably found in these protected reserves, but they are still at risk from poachers. Your visit helps to protect them. Active conservation efforts and the quest to keep the remaining animals out of poacher’s gun sights means that most rhinos now live in parks and reserves that have resources to provide special protection. As it becomes possible, individual rhinos are being relocated from precarious areas to more protected places in the hope that they will survive and breed. One advantage for viewers is that, unless otherwise noted, it is possible to see both the black and white rhino species at the following parks. The Lewa Wildlife Conservancy is located in northern Kenya, south of Isiolo town and North of Mount Kenya. Covering 62,000 acres (25,090 hectares), snow-capped peaks dominate the views to the south, where the southern boundary rises to an altitude of some 6500ft (1,970 meters) above sea level and to the north, the terrain drops away with breathtaking views of Samburu, Ololokwe and the Mathews’ range beyond. The wildlife sanctuary incorporates the original Lewa Downs cattle ranch and the Ngare Ndare Forest. The Northern Rangelands Trust, an innovative partnership with a number of communities to the north who have given land for the preservation of wildlife, is also part of the conservancy. In 1983, the Craig family set aside 5,000 acres of their cattle ranch, Lewa Downs, for wildlife conservation, specifically for black rhino protection. At that time, an epidemic of rhino poaching was sweeping East Africa. Kenya’s black rhino population had fallen from over 20,000 in the 1970’s to a few hundred in the early 1980’s. The Craigs set aside land at the western end of Lewa Downs, and Mrs. Anna Merz funded the the original conservation program. The result was the fenced and guarded Ngare Sergoi Rhino Sanctuary. The sanctuary was stocked with isolated and endangered individuals from northern Kenya and rhinos from other reserves. White rhinos were added after the black rhino population began to successfully breed. In 1995, the sanctuary was expanded to cover the rest of the ranch, and the adjoining Ngare Ndare Forest Reserve. Today all 62,000 acres (25,090 hectares) are dedicated to conservation, and the sanctuary is listed on the International Union of Conservation of Nature (IUCN) Green List of successful protected areas. In June, 2013, Lewa Wildlife Conservancy and Ngare Ndare Forest Trust achieved UNESCO World Heritage Site status as part of the existing Mount Kenya World Heritage Site. Education: The Lewa Education Program supports 21 schools through construction of classrooms, lavatories, libraries, boarding facilities, dining halls, kitchens, teachers’ housing, fences, laboratories and more. The program also provides scholarships to over 400 promising students, oversees six adult literacy centers, and sponsors a digital literacy program. Close to 6,500 children and 300 adults benefit from this extensive program that demonstrates how wildlife conservation can transform the fate of communities by facilitating development. Healthcare: Working closely with the local government, Lewa supports four clinics and runs one of its own. These clinics are the closest medical facilities for all of the remote communities in the conservancy. For thousands of Kenyans, these clinics are their only source of healthcare. By addressing the healthcare needs of local communities, Lewa gains the communities’ respect and support for its conservation work. Agriculture: The majority of the people living in communities adjacent to both the Lewa Wildlife Conservancy are small-scale farmers. Lewa has implemented a number of programs to assist these farmers maximize production while minimizing any negative impacts on the ecosystem, including crop diversification, water harvesting, irrigation methods, and crop monitoring. the most important program ishands-on training in techniques that preserve soil quality to prevent land degradation. Economic Empowerment: Lewa launched the Women’s Micro-Enterprise (WME) program in 2001, with the first loan granted in 2003. 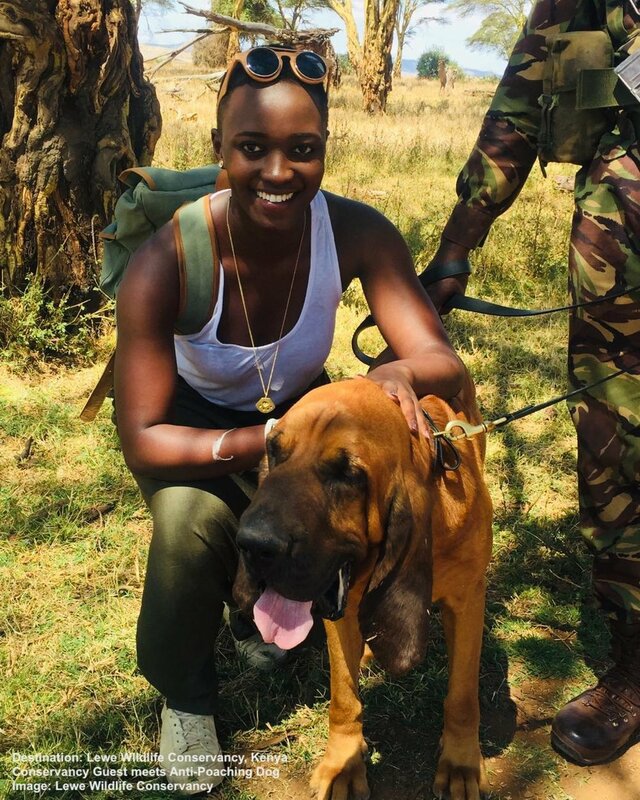 Aside from receiving capital and training, women also learn the importance of environmental preservation and wildlife protection. Rhinos: The Lewa Wildlife Conservancy is home to 14% of Kenya’s rhino population, including descendants of the few remaining native wild black rhinos from the 1980’s. Subspecies include the eastern black rhino and the southern white rhino. Other Wildlife: Lewa is home to the “Big Five” (elephants, rhinos, Cape buffalo, lions, and leopards), but it also supports a diverse array of wildlife. Lewa is instrumental in protecting the endangered Grey’s zebra and the reticulated giraffe, both considered endangered by the IUCN. Predators include lions, leopards, and cheetahs, with African painted dogs occasionally entering the sanctuary. 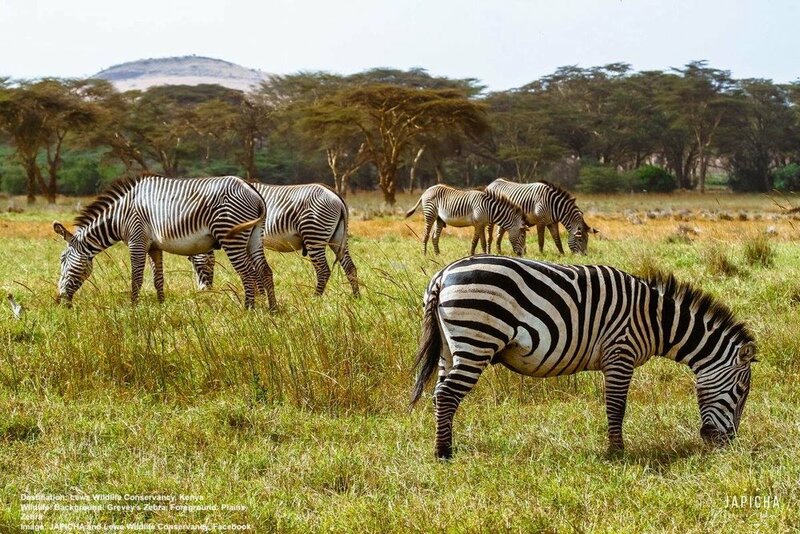 ENDANGERED GREVEY’S ZEBRAS ARE THRIVING AT LEWA (BACKGROUND), WHICH IS ALSO HOME TO PLAINS ZEBRA (FOREGROUND) IMAGE: ©JAPICHA FOR LEWA CONSERVANCY. Additionally, the lance-like horned beisa oryx and the rare greater kudu are seasonal visitors and the Guenther’s dikdik, the giraffe-necked gerenuk and the beautiful blue-legged Somali Ostrich are resident all year round. The swamp has become a sanctuary for the rare and fascinating semi-aquatic sitatunga antelope. At night, leopard are frequently encountered along with bush-babies, aardvarks, bat-eared foxes, caracal and various mongooses, genets and civets. Birdlife is equally rich with numerous species of bustard, plover, coursers and birds of prey among the 350 species known to frequent the conservancy. Notable birds to add to your life list include eastern chanting goshawk, secretary bird, grey crowned crane, Northern anteater chat, and the Somali ostrich. The Ol Pejeta Conservancy is an 89,600 acre (36,260 hectare) not-for-profit wildlife sanctuary in Central Kenya. Situated on the equator west of Nanyuki, between the foothills of the Aberdares and Mount Kenya. With over 10,000 large mammals, Ol Pejeta has the highest game-to-area ratio in Kenya. It is the only park where the “Big 5” and chimpanzees can be seen. And poignantly, the conservancy is home to the last two northern white rhinos. Ol Pejeta has had a colorful list of previous owners including Lord Delamere, an influential early settler from Britain that helped build Kenya’s agricultural economy, shipping tycoon Aristotle Onassis’ father Roussel, and the arms dealer, and one of the world’s richest men in the 1980’s, Adnan Khashoggi. Lacking the reliable rainfall required for crops, the Laikipia Plateau was used extensively for cattle grazing during the colonial period. Following World War II, the then 57,000 acre (23,0870 hectare) ranch became a successful beef producing company, which expanded to roughly 90,000 acres (36,420 hectares) over the next few years. As cattle ranching became less profitable, elephants, which had long used the ranch as a migration corridor from the north to Mount Kenya and the Aberdares, began to take up permanent residence on the property. As a result, the enclosures required for intensive cattle production were destroyed by the elephants, and became impossible to maintain cost-effectively. JAMES MWENDA LOVINGLY CARES FOR SUDAN, THE LAST NORTHERN WHITE RHINO MALE, A FEW DAYS BEFORE HE DIED. IMAGE THANKS TO STEVE RUSSELL STUDIOS. In 1988, then owner Lonroe Africa, dedicated 24,000 acres as the Sweetwaters Game Reserve, primarily as a sanctuary for the endangered black rhinoceros. Since that time, wildlife populations have continued to increase. In 2004, working with the Lewa Wildlife Conservancy, the UK-based conservation organization Fauna and Flora International purchased the ranch and surrounding land. Today, Ol Pejeta is a Kenyan-owned operation supporting local community development and economic growth in addition to its impact on conservation. Northern White Rhinos: Ol Pejeta may be best known as the home to the last two remaining northern white rhinos. Kept in a special boma and under constant guard, visitors can have the unique experience of seeing these majestic creatures up close. The Sweetwaters Chimpanzee Sanctuary: A joint venture between The Jane Goodall Institute and Kenyan Wildlife Services, the sanctuary is a refuge for orphaned and confiscated chimpanzees. The chimpanzees are protected on an island in as natural environment as possible. Visitors arrive by boat to see them. Integrated Agriculture: Over the past decade, Ol Pejeta has proven that wildlife-livestock integration works - and it is actually beneficial to the grasslands. The trampling effect and controlled grazing of cattle improves the quality of grass very quickly, which attracts herbivores from all over the sanctuary. Rhinos: Beside the two remaining northern white rhinos, Ol Pejeta is home to the largest population of black rhinos in Kenya. In 2005, southern white rhinos were introduced, and there is now a healthy population in the reserve. Other Wildlife: All members of the "Big five game" (lion, Cape buffalo, African elephant, leopard, and rhinoceros) can be found on the Ol Pejeta Conservancy. 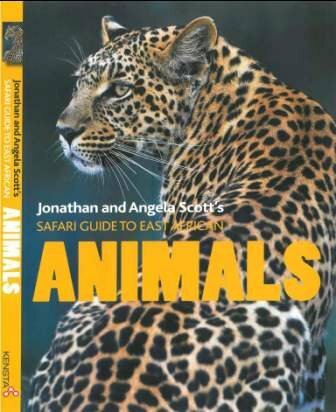 Ol Pejeta is home to several rare animals, including the endangered African painted dog, serval, cheetah, Grevy’s zebra, Jackson’s hartebeest, and bat-eared fox. Giraffes, vervet monkeys, baboons, hippos, impalas, elands, Grant’s gazelles, dik-dik, plains zebras, oryx, silver backed jackals, and hyenas can also be seen in the sanctuary. Birds: Ol Pejeta Conservancy is a bird-watcher's paradise with over 500 species recorded. Notable birds include ostrich, the endangered white-backed vulture, martial eagle, cinnamon-chested bee-eater, black winged lapwing, Hildebrandt's starling, Rosy-throated longclaw, and the secretary bird. Cattle: Okay, they are not “wildlife”, but Ol Pejeta is still a working cattle ranch and maintains a herd of 6,000 beef cattle. These purebred Boran cattle are widely considered the hardiest breed in Africa, and produce high quality beef with low quality forage. They are perfect for the Ol Pejeta habitat, as they are also very ‘bush savvy’ and stick together as a herd. At night, the cattle are corralled in a predator-proof enclosure (boma). SUNSET OVER DAMARALAND AT THE DESERT RHINO CAMP IN THE PALMWAG CONCESSION, NAMIBIA. IMAGE: COURTESY SAVE THE RHINO TRUST. Desert Rhino Camp is located in the private Palmwag Concession area in The Kunene Region, which covers about 1,930 square miles (5,000 sq km) between Etosha National Park and the Skeleton Coast. This region is marked for its tranquil, minimalist beauty, surprising numbers of desert-adapted wildlife, and the world’s largest free-roaming population of the critically endangered black rhino. Desert Rhino Camp is operated as a collaboration between Wilderness Safaris and Save the Rhino Trust (SRT). 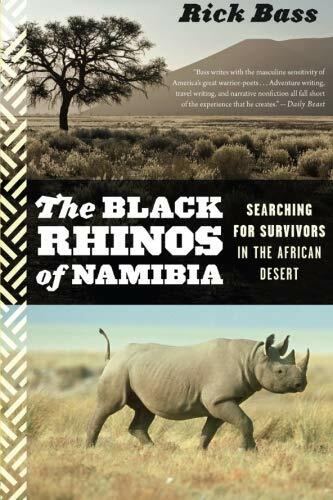 SRT has been the leading organization working to protect the desert-adapted black rhino of the Kunene and Erongo regions. Hunting and poaching had almost eradicated their populations in the arid regions, but since the 1980’s the population of these magnificent animals has increased five times! 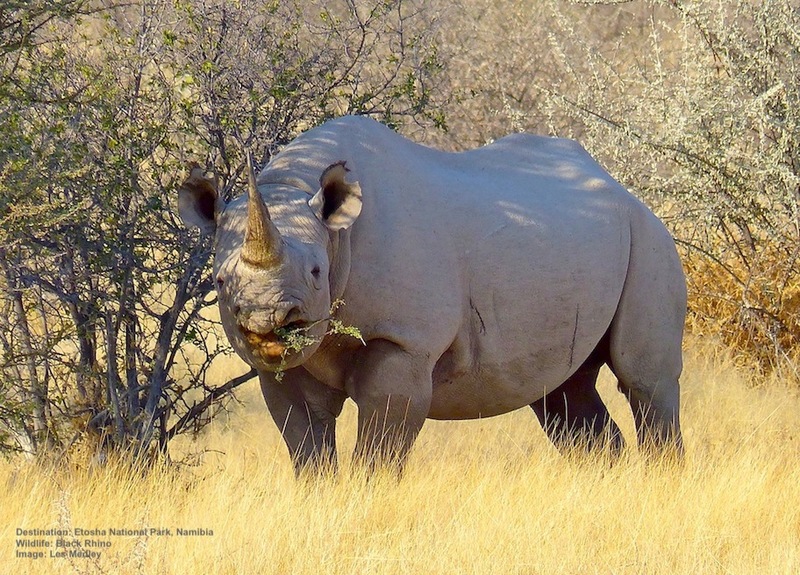 Today, the Palmwag Concession boasts the largest concentration of black rhino anywhere outside of a national park, and Desert Rhino Camp offers a brilliant insight into the ecology and conservation of this incredible area. The camp also directly contributes to the SRT, and ultimately the sustainability of this vulnerable habitat and its wildlife. Namibia has some of the most beautiful environments on the planet, and one such place is the Kunene Region in the North. This region, which is divided into Damaraland and Kaokoland, is mostly desert and semi-desert yet it is home to three remarkable large mammals: Specially adapted rhinos, elephants, and lions live out their lives in this wind swept and starkly beautiful region. MOST RHINOS NEED TO DRINK EVERY DAY, BUT THESE DESERT-ADAPTED BLACK RHINOS MAY ONLY DRINK EVERY THIRD OR FOURTH DAY. IMAGE: COURTESY SAVE THE RHINO TRUST. Desert-Adapted Rhinos are more solitary than other black rhinos, and have a horn that is slightly longer and thinner than the regular Namibian black rhino, which helps them to forage in this barren environment. They are also mostly nocturnal in order to avoid the excessively high daytime temperatures and need to drink only every third or fourth night. The rhinos of the Kunene and Erongo regions are truly wild; they are free to roam over 9.650 square miles (25,000 sq km) of desert habitat with no fences or barriers. And they are experts at crossing this massive rugged area, generally having home ranges of close to 200 square miles (500 sq km)! 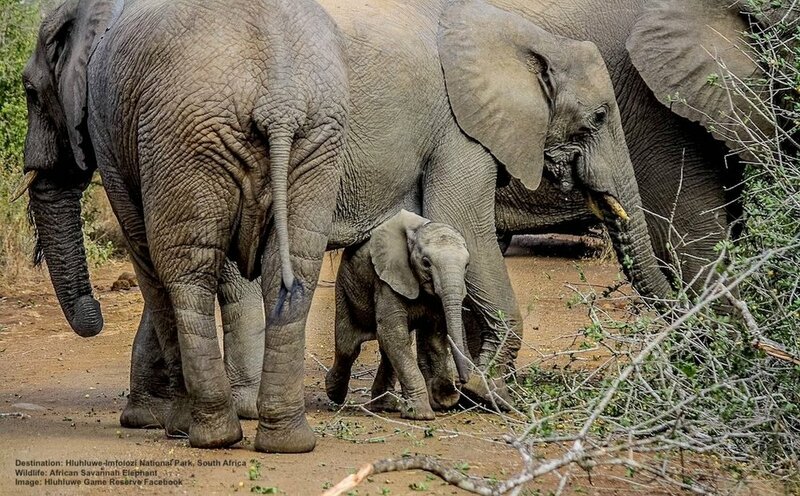 ALL BABY ELEPHANTS DEPEND ON THEIR MOTHERS, BUT THE LIVES OF THE ENTIRE HERD DEPENDS ON ITS MATRIARCH’S EXPERIENCE AND KNOWLEDGE OF SCARCE WATER SUPPLIES IN THE DESERT. IMAHE THANKS TO DESERT ELEPHANT CONSERVATION. Desert-Adapted Elephants: The most obvious difference between the desert-adapted elephant and their non-desert-adapted relatives are the size of their feet, which are larger to make it easier for them to move with ease across the soft desert sand. They also tend to be taller and leaner than other African elephants, with slightly longer trunks which allow them to dig down into the sand to find underground water. While the elephants in Etosha drink up to 50 gallons (200 liters) of water a day, the desert adapted elephants the Kunene Region only drink water every three to four days. There is also evidence that their tusks may be more brittle due to the lack of key minerals in their diet. Rhinos: The desert-adapted black rhino is the reason to come to Desert Rhino Camp. But the tracking is not always easy, as these are truly free-roaming animals widely distributed across the area. Other Wildlife: Aside from the desert-adapted black rhino to be found in the area, Palmwag Concession's freshwater springs also support healthy populations of desert-adapted elephant, Hartmann's mountain zebra, giraffe, gemsbok, springbok, kudu and predators such as lion, cheetah, leopard, and brown and spotted hyaena. Birds: Birding enthusiasts will enjoy the diverse bird life found in the Palmwag Concession. Raptors include greater kestrel, lanner falcon and booted eagles, and Namaqua sandgrouse, Burchell's courser, while Verreaux’s eagle is often sighted around rocky hillsides. Other potential sightings include bokmakierie, grey-backed sparrowlark, Monteiro's hornbill, and white-backed mousebird. Regular endemics include Rüppell's korhaan, Benguela long-billed lark, and possibly Herero chat with some focused searching. Etosha means “great white place” in the Ndonga language. The park is named after the 1,850 square mile (4,790 square km) mirage-inducing salt pan that is the centerpiece of the park. Located in Northwest Namibia, Etosha spans 8,600 square miles (22,270 square km) and is considered one of the largest national parks in the world. 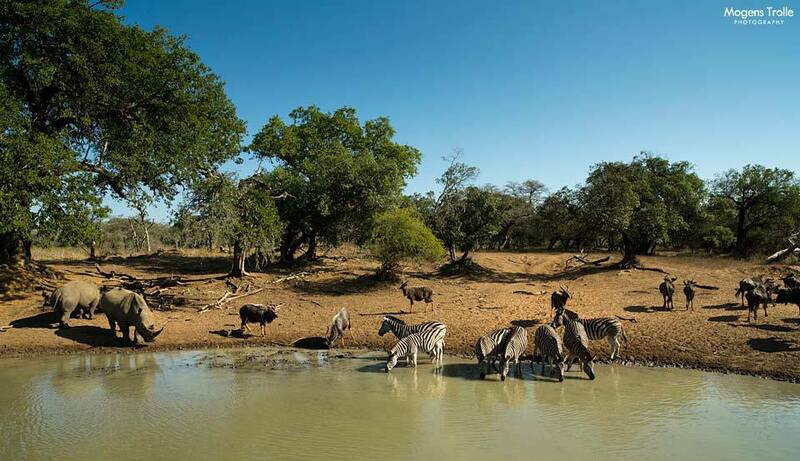 It is also one of the most accessible parks in all of Africa, where the abundant wildlife that congregates around the waterholes, giving you almost guaranteed wildlife sightings. What sets Etosha National Park apart from other game parks and reserves in Southern Africa is its namesake salt pan. Covering 1,850 square miles, or approximately 5,000 square kilometers, this flat and saline desert is what makes viewing wildlife here so easy. For just a few days every year, following a wet season rain, the sunbaked pan transforms into a shallow lagoon overrun with flamingos and pelicans. During the rest of the year, the pan is bone dry, which means the park’s 86 natural and man-made waterholes are the only source of water. Add to that, the 2,200 miles (3,550 km) of road providing easy access to many of these waterholes, and the wildlife viewing could not be easier. Simply park next to a waterhole and wait for the wildlife to come to you. Each of Etosha’s camps features a waterhole where guests can sit for hours watching the wildlife come and go. Some of these camp-side waterholes are lit at night, which is ideal for rhino spotting as these special creatures prefer to drink at night. But of all the camp waterholes, the Okaukeujo waterhole (at the camp of the same name) is a stand out. This renowned location has a low wall around one side of the large waterhole where you can sit on a bench just a few yards away from some of Africa’s most iconic wildlife. 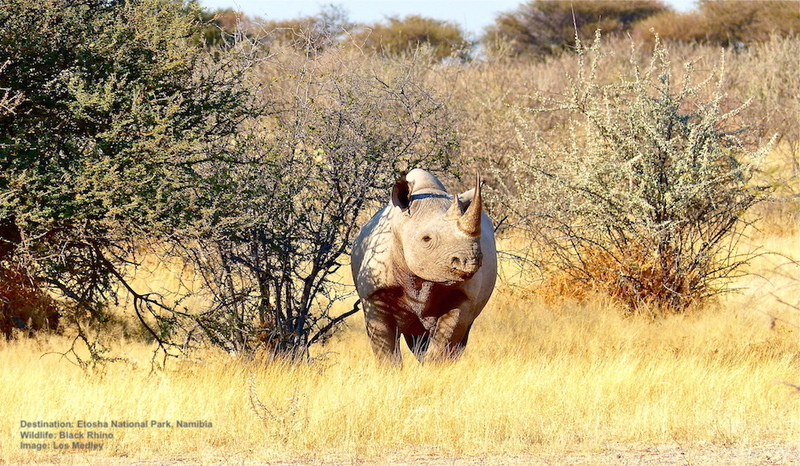 Rhinos: Etosha is home to both the southern white rhino and the southwestern black rhino. Rhino populations are reasonably healthy, but the park does not release population numbers. 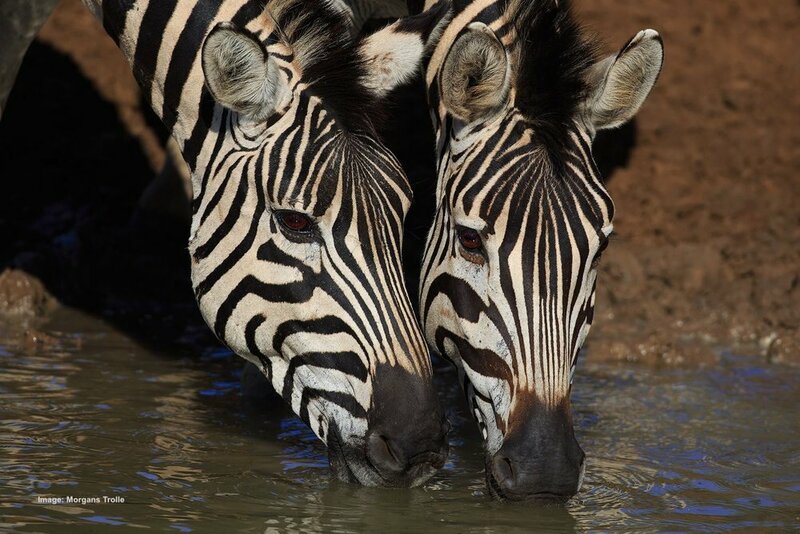 The best place to see either type is at the lighted waterholes near the park’s camps. Other Wildlife: Etosha is home to 114 mammal species, 110 reptile species, and 16 amphibian species. The large mammals in Etosha National Park include lion, leopard, elephant, rhino, giraffe, wildebeest, cheetah, hyena, mountain and plains zebra, springbok, kudu, oryx, and eland. Among the smaller species are jackal, bat-eared fox, warthog, honey badger, and ground squirrel. Birds: 340 species of bird call Etosha home for at least part of each year. During the summer rains (January & February), the pans fill with water, and thousands of flamingos arrive to breed. Other notable birds include kori bustard, ostrich, Monterio’s hornbill, tawny eagle, martial eagle, African openbill, great crested and black necked grebe, Pale chanting goshawk, lilac-breasted roller, and eight species of owl. Kruger National Park is one of the largest game reserves in Africa, covering an area of 7,525 square miles (19,485 sq km). South Africa’s first national park is now part of the Great Limpopo Transfrontier Park, a peace park that links Kruger National Park with the Gonarezhou National Park in Zimbabwe, and with the Limpopo National Park in Mozambique. The park is also part of the Kruger to Canyons Biosphere, an area designated as an International Man and Biosphere Reserveby the United Nations Educational, Scientific and Cultural Organization (UNESCO). Kruger is one of the largest national parks in the world, almost as large as Belgium. It is about 220 miles (360km) from north to south. Including the adjacent private reserves (which share an unfenced boundary with Kruger) and the Limpopo Transfrontier Park stretching into Mozambique, it is a conservation area of about 11,580 square miles (30,000 sq km). THE SABLE ANTELOPE. ONE OF EAST AND SOUTHERN AFRICA’S ICONIC SPECIES. IMAGE: COURTESY©Marc Cronje, IN KRUGER NATIONAL PARK. The landscape of Kruger is spectacular. The bush looks the same as it did thousands of years ago. Although it has good infrastructure, including an extensive network of roads (paved and unpaved) and many different accommodation options, it remains a true wilderness area. The Kruger National Park is home to five vegetation zones, each with their own special feel and diverse range of species. From arid semi-desert to thickly wooded areas with flowering trees, it is a kaleidoscope of habitat and wildlife. And the park has the largest variety of different mammal species of any national park in the world. Rhinos: Although rhinos have been under tremendous poaching pressure over the past decade, Kruger continues to maintain one of the healthiest rhino populations in the world. The vast majority of Kruger’s rhinos are southern white rhinos. They are especially common in the southern portions of the park. Kruger’s black rhino population is much smaller and scattered. 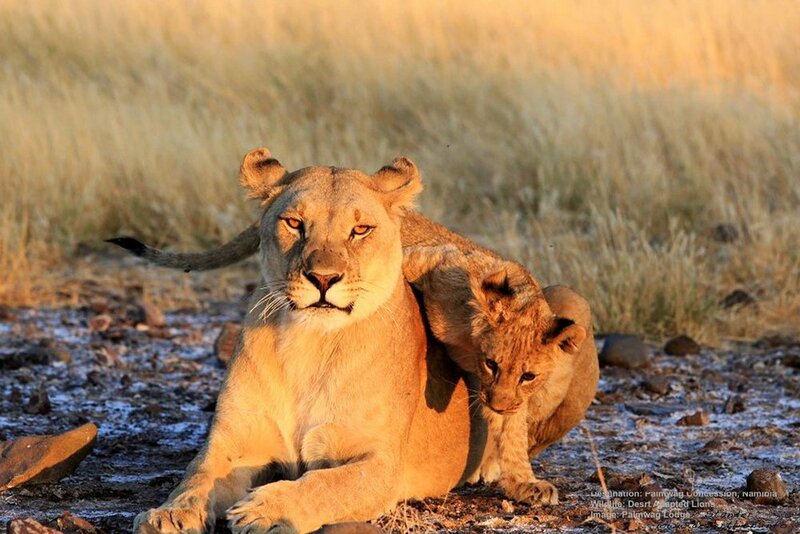 Lions are some of the plentiful wildlife in Kuger National PArk, SOuth Africa. Image: COURTESY OF ©Marc Cronje Independent Field Guide, Kruger National Park, South Africa. Other Wildlife: Kruger has more species of large mammals (147) than any other park in the world. It is home to all of the iconic African wildlife are present, including lion, cheetah, leopard, giraffe, black and white rhino, elephant, wildebeest, hippos, baboons, warthogs, African painted dog, vervet monkey, Cape buffalo, hyena, and an endless variety of antelopes. THE ENDANGERED aFRICAN PAINTED DOG, IS THE CONTINENT’S MOST EFFICIENT HUNTER. THIS ONE IS TAKING A NAP IN KRUGER NATIONAL PARK, SOUTH AFRICA. IMAGE: COURTESY OF ©Marc Cronje. Birds: 517 species of birds have been identified in the park. Among the more prominent raptors are the bateleur eagle, brown snake eagle, African fish eagle, and tawny eagle. Other notable species include lilac-breasted rollers, bee-eaters, kingﬁshers, grey louries, hornbills, weavers and starlings. The bird population grows by approximately 200 migrant species between October and March. The migrants and nomads normally arrive from elsewhere in Africa and from Eurasia after the first summer rains. The availability of water ensures that food is plentiful. Most will depart by mid-April. WHITE RHINOS USING “THEIR” ROAD AT HLUHLUWE-IMFOLOZI PARK. IN THE LATE 1800’S THE ONLY REMAINING POPULATION OF WHITE RHINOS IN THE WORLD WAS A SMALL NUMBER IN THE AREA THAT WAS TO BECOME THIS PARK. Image: HLUHLUWE GAME RESERVE facebook. 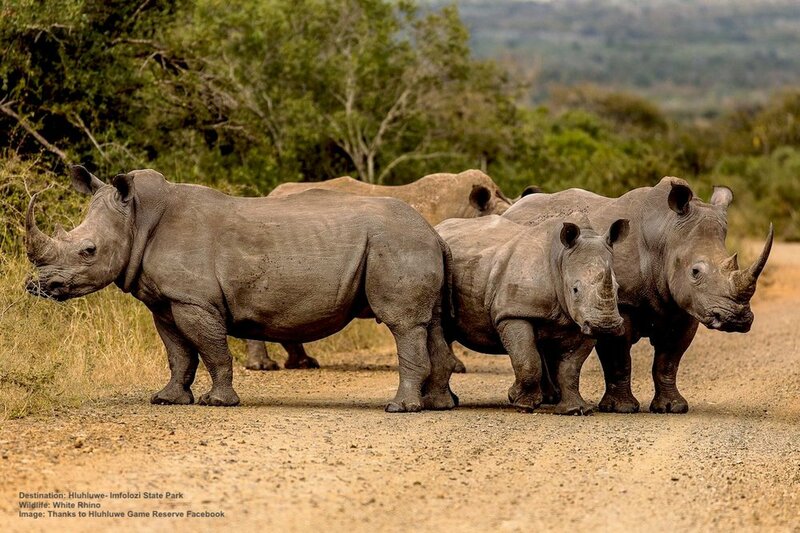 Set within the scenic rolling hills of Zululand in KwaZulu Natal, Hluhluwe-Imfolozi Park, formerly known as the Hluhluwe uMfolozi Game Reserve, is home to incredibly important populations of both white and black rhino. The large rhino population within the reserve is the result of an intense conservation effort that literally brought white rhinos back from the brink of extinction. Officially opened in 1895, the park is the oldest proclaimed reserve in Africa. consisting of 370 square miles (960 sq km), the park was originally a hunting ground for Zulu royalty. During the 19th Century, rhinos had been hunted almost to extinction by successive waves of explorers, settlers, and hunters who moved into their ranges. Depending on your source, by the early 1920’s there were somewhere between 14 and 100 southern white rhinos left, all in the uMfolosi Game Reserve. The Natal Provincial Government implemented a ban on all hunting, and the population began to recover. LARGE HERDS OF UP TO 200 ELEPHANTS CAN BE SEEN AT HLUHLUWE-IMFOLOZI. Image: HLUHLUWE GAME RESERVE facebook. Rangers in the uMfolosi Game Reserve, led by Ian Player, assisted veterinarian Dr Anthony Harthoorn (who developed the amazing drug cocktail M99 with which a rhino could be immobilized and safely moved around), hit upon a method of catching, removing, and redistributing “problem animals.” With some minor refinements made possible by modern technology, this method is still in use today. Operation Rhino: Basically, the rhino was stalked and darted by a man on foot (which provided some classic moments of comedy and high drama), tracked by horsemen until the drug took effect, then coaxed into a crate, loaded onto the back of a truck, and moved to its next home. 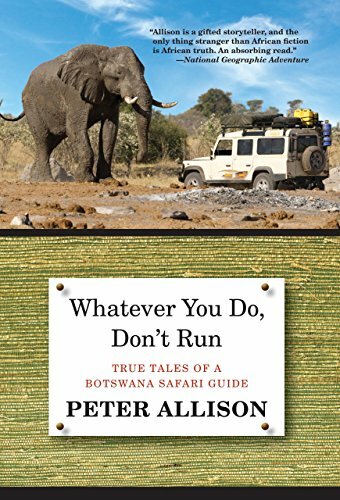 The first refinement was to use a doorless Land Rover to carry the shooter who would fire the dart from a fast moving, bumping vehicle into the rump of a running rhino – and this too provided its moments of hilarity and drama. Today, helicopters are often used for this task. White rhinos were then moved to other selected sanctuaries throughout Africa. Umfolozi provided the initial breeding stock for repopulating Africa’s major parks in South Africa (including Kruger), Botswana, Mozambique, and many others. Hluhluwe-Imfolozi Park is the genetic home to every White Rhino population in the World. The White Rhino story has to be one of the most successful conservation efforts of all time. Rhinos: Hluhluwe-Imfolozi Park is home to a large population of both black and white rhino. The large population of rhino's in the park is the result of intense conservation of small populations since the turn of the century. Other Wildlife: The park is one of the world's top spots for viewing nyala. 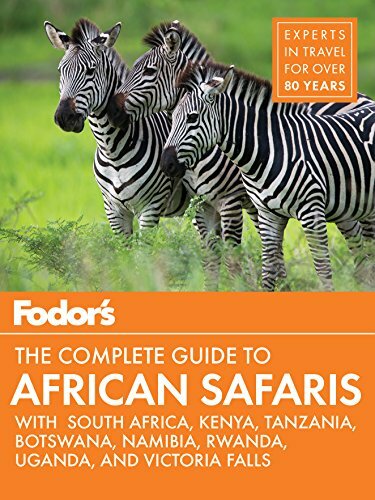 it is also home to 86 special species, including: Africa's “Big Five” (elephant, rhinoceros, Cape buffalo, lion, and leopard), Nile crocodile, hippo, cheetah, spotted hyena, blue wildebeest, jackal, giraffe, zebra, waterbuck, eland, kudu, impala, duiker, suni, reedbuck, common warthog, bushpig, mongoose, baboons, monkeys, a variety of tortoises, terrapins, snakes and lizards. Birds: The park is a prime birding destination and is home to 340 bird species. The Hluhluwe River Flood Plain is one of the only areas in the whole of South Africa where yellow-throated, pink-throated, and orange-throated longclaw species can be seen together. Bird species include night heron, Wahlberg's eagle, Shelley's francolin, black-bellied korhaan, Temminck's courser, Klaas's cuckoo, little bee-eater and crested barbet. First proclaimed in 1912, uMkuze Game Reserve is one of the 10 jewels of iSimangaliso Wetland Park, South Africa’s first UNESCO World Heritage site. Situated in Northern Zululand, KwaZulu-Natal, the reserve covers 98,850 acres (40,000 hectares) of wildly varying habitats. Although best known as an incredible birding location, it is possible to view both rhino species from water hole blinds, where you may also sight elephants, giraffes, and antelope. 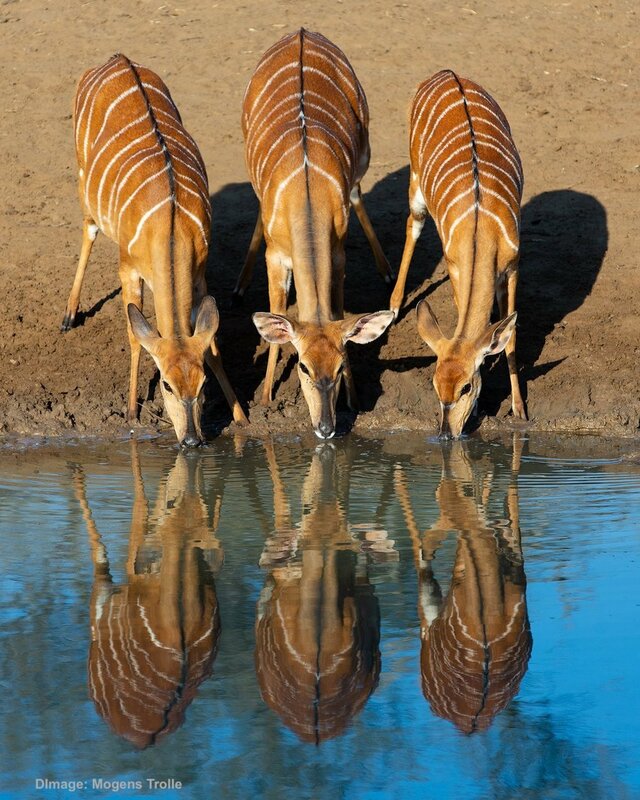 A TRIO OF FEMALE nyala stop to drink at one of the many water holes at this UNESCO Heritage site: uMkuze Game Park, KwaZulu-Natal. Image: COURTESY OF ©MOGENS TROLLE. What sets uMkuze apart from other parks is its astonishing diversity of natural habitats. There are low lying hollows adjacent to ancient red sand dune ridges and broad stretches of gently rolling acacia savannah. The slopes of the Lebombo mountains to the west contrast with a variety of woodlands, low-lying swamps, and riverine forests, including stretches of fig trees along the Mkhuze River. In the heart of the reserve is a rare sand forest, noted for its spreading, dark-leafed sherbert trees and red heart trees, which release pink-winged seeds in the autumn. Three game viewing hides have been constructed next to the Kubube, Kamasinga, Kwamalibala pans. During the drier winter months, or anytime water levels have decreased in the pans, large concentrations of game may be seen at the waterholes. This provides excellent views of the reserve’s larger mammals. These hides also offer unique opportunities for photographers, and many famous wildlife photographs have been taken there. Farther north and east lie two beautiful shallow pans, Nhlonhlela and Nsumo respectively. These are lined with water lilies in the summer and home to communities of hippo, crocodile, pelicans, as well as a diversity of ducks and geese which gather in spring. Rhinos: uMkuze is home to both the southern white rhino and the south-central black rhino. Unlike most other parks, the black rhinos here are direct descendants of animals present when the park was declared in 1912. Other Wildlife: The diversity of habitats supports a wide variety of wildlife, including elephant, black and white rhinoceros, giraffe, nyala, blue wildebeest, warthog, eland, hippo, impala, kudu and other smaller antelope. Rare species on the reserve are cheetah, hyaena, suni, African painted dog, and leopard. Birds: Mkuze is renowned as a destination for bird lovers with more than 420 bird species on record. uMkhuze is considered to be one of South Africa's top bird watching destinations. Each of the diverse habitats within the nature reserve is said to have its own unique 'special' species. Of particular note are crowned and trumpeter hornbills, white-eared barbets, African green pigeons and Narina trogons. Gazing up into the trees one might also spot a Pel's fishing owl, and the waters of the Nsumo Pan are home to South Africa's only breeding colony of pink-backed pelicans.